Anyway, when we were little, my mom would just get us the chocolate ones. Except we'd forget about them after a few days and they'd stay in the fridge until March or something ;) Do you have an advent calendar story or something special you do with your family? Okay well, on with the list of beautiful advent calendars! 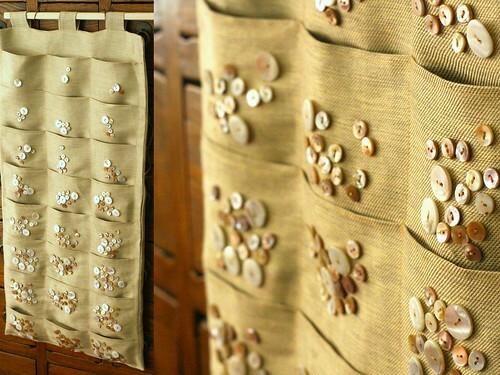 i love the button calendar!! 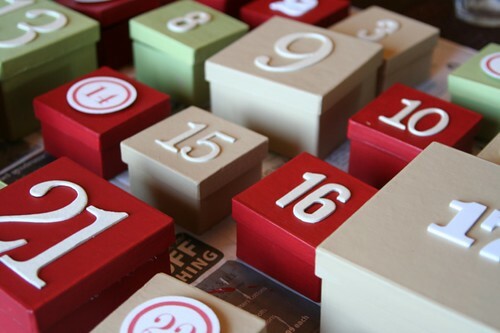 What great advent calendars you've found! I recently made one using a 24 muffin tin but now I'm about ready to get to work on another one! I adore all of the hanging string ones, especially the one by sperobene. So glad the holidays are finally upon us! Very beautiful advent calendars. Lots of great ideas. Maybe this year I will create one for my husband?? I never had advent calendars in our household. If not I could always create one for my niece...we shall see. There's always next time. I also love advent calendars. I have had one in my mind to make for the past few years, I've just never gotten arount to putting pen to paper, or rather needle to fabric. Maybe this year! have just posted today about one I have just finished for my niece (http://onerainyafternoonbyzoe.blogspot.com). We have a wooden one with little drawers but the problem is that the drawers are so tiny really all you can get in is a small chocolate so last year I made little bags and hung them pieces of string - that looked pretty too and meant I could be more imaginative with the presents! We always had the chocolate advent calendars when I was growing up in Germany! My hubs and I have a store-bought one that looks similar to the one you featured by saintjin (with the little square doors). They're just big enough for a piece of candy for him, and a piece of candy for me. So fun! i really want to do one this year too! i'm really loving that letteria one! these are so pretty and non-typical! Oh oh oh! I love these! I didn't think I was ready for Christmas, but that's the point of Advent, right? You really rounded up some lovely ones! 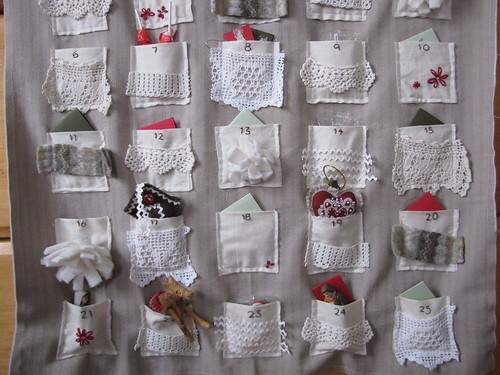 My mother made a cross-stitch calendar with ribbons, and we'd tie mini gifts onto it each year. 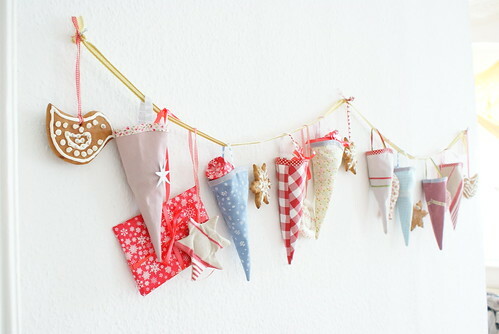 We still hang it up, even though we don't need the gifts any more. For a boyfriend, I once wrapped 24 gifts inside each other-- #24 being the smallest, wrapped inside #23, wrapped inside #22, etc. That was fun! 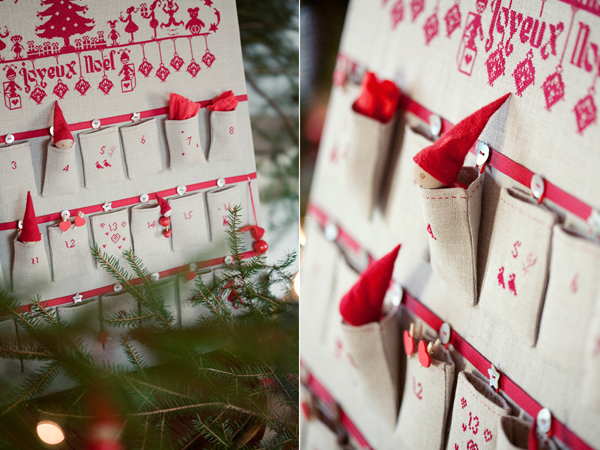 I LOVE LOVE advent calendars, and these are too cute!! Oh, I love Advent calendars too! Every year I think about making one, but always run out of time. Maybe this is the year? For your advert calender for Nicholas, maybe you can put sweet notes in for him... I like to use quotes from movie/ tv shows we watch and have a good laugh when we open it. Or you can write little clues and maybe hide little gifts around the house? Or maybe make a advert calender out of t-shirts? My nerdy bf loves tshirts from ThinkGeek or Threadless.. you can number each shirt and he can open them each day to reveal the tshirt message. Sorry! I meant advent.. kept spelling advert.. hahah.. advertising brain! Oh, I want to make them all! I love all of these! I would need to get multiples because I could not decide which one to get. I want one of each! Especially that gold button/pocket one... Thanks for your inspiring posts! These are wonderful, thank you for sharing! I love advent calendars and now I'm itching to go buy matchboxes! love to you on this tuesday danni! I just love advent calendars! I always had one growing up and looked forward to them every day!! I think I'm going to have to get one of these lovlies for my own house! Love! 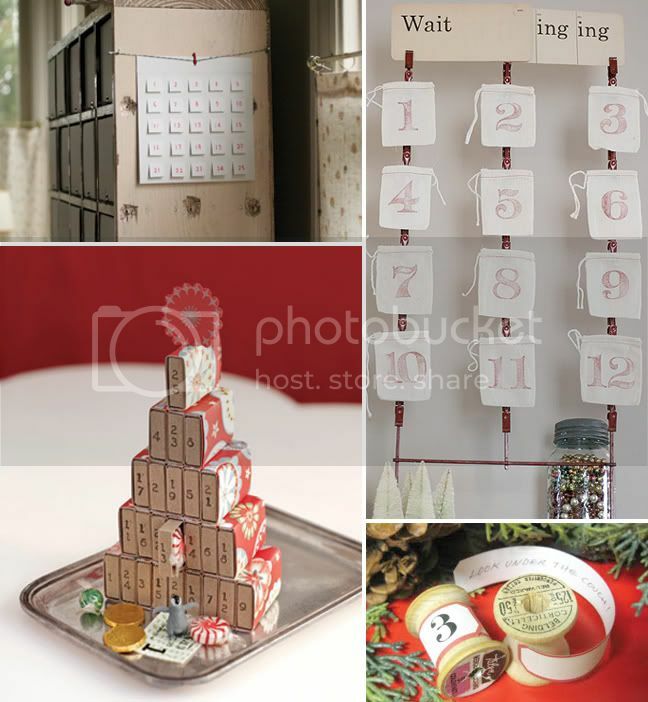 Honestly, the first thing I thought of was a felt Advent calender like the one my grandma made for each of her children's families, but gamer style (like this but not stuffed; my grandma was all about the rick rack and sequins!). Gosh! These are lovely! I'm so excited about christmas. I'll definately have to make an advent, I think! These are all great! Wonderful creative ideas. 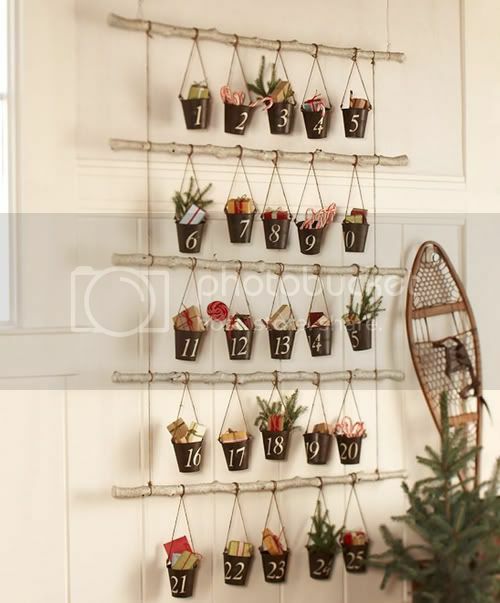 Great minds think alike :) I spent the entire morning looking for DIY advent calendars. Thank You for summing them up! Eee!!! These are precious! So cute!!! These are all so creative and pretty!! Love them! Love the last one from Pottery Barn. I'm going to have to make one for my boy's first Christmas! These ideas are all so unique! haha i've had advent calendars on the brain too! i just spent so long a few days ago looking for cakiesblog (which i had forgotten the name of!) because she had a really awesome advent i wanted to remember to try this year. we always had a handmade cross stitched one of a sweet nativity. my mom's friend made it and gave it to our family. now that i have my own home i'm trying to think of something we can treasure too! oh my goodness. Thank you so much for the round up. I have been searching for the perfect advent calender to give my husband on St. Nicholas day Dec. 6th. This is enough inspiration to get me to make one! Very Cute! I have also seen a really cute advent calendar made up of tiny little mittens... just enough room to add a chocolate a day! Thank you so much for featuring my calendar with all these other BEAUTIFUL ones! these are all so lovely and unique! button calendar is perfect!! but all are so cute! How many calendars could I copy and hang in my house with going overboard? 12? 15? They are all so wonderful!! !